Panama City, FL (October 15, 2018) – On most days you’ll find John “ZZ” Gavrun and John “Animal” Kirchens riding their motorcycles, preaching the gospel of Jesus throughout Panama City. 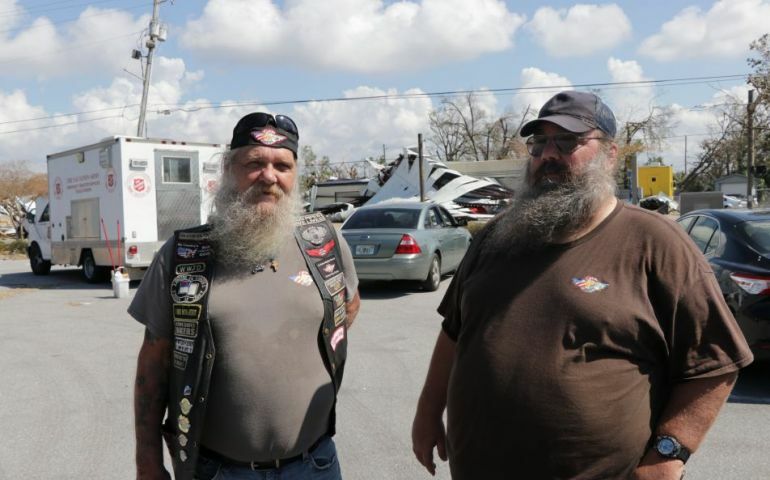 They’re both members of Faith Riders, a local motorcycle ministry; but on this day, the pair was riding in Gavrun’s car, its roof barely intact from the effects of Hurricane Michael which devastated the area less than a week ago. Today’s mission was to find a hot meal to keep them and their families going. “We lived through it, watched it come in, watched the trees come crashing down all around us. It was devastating,” says Gavrun. He had seen hurricanes before, never heeding the call to leave and Michael was no different.